You are here: Home / Blog / SEO Training / What is AMP and What Effect Does it Have on SEO? I often get asked about AMP (Accelerated Mobile Pages) and what effect it has on SEO and so here is a short blog post on the subject. John Muller of Google recently stated that AMP is not currently a SEO ranking factor. Hold on! You said that page speed was a ranking factor? Should I be Using AMP Now? If you run a news site, then I would say yes. Google has a special AMP news feed scroller that it often shows in the search results. Other than that, I would say – not now. 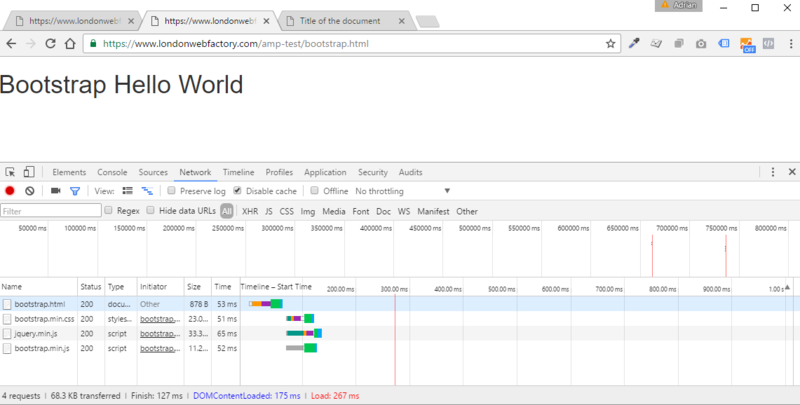 Here is a simple test to compare the speed of AMP against Bootstrap and Pure HTML5. 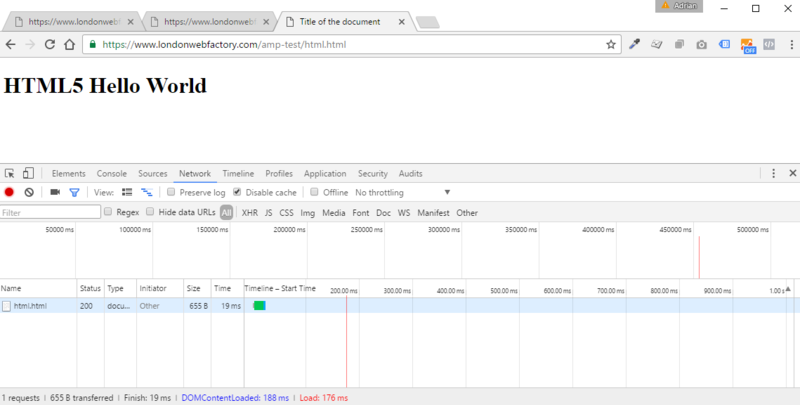 To do this I created three simple “hello world” webpages using each of the technologies and gathered the DOMContentLoaded and Load results for the three pages. Notice the DOMContentLoaded and Load results shown in blue and red at the bottom of the screenshot. DOMContentLoaded = 148 ms, Load = 207 ms.
DOMContentLoaded = 175 ms, Load = 267 ms.
DOMContentLoaded = 188 ms, Load = 176 ms.
To help put things in perspective I added the results for the same test run on the Amazon.Com home page. You can see that the three technologies under test are almost identical in terms of load speed. However, Twitter Bootstrap V3 is vastly superior in terms of functionality and features and is a much better choice if you are developing a custom template or website. I’m sure AMP will catch-up in the future though and when it does I’ll start using it.